Objective: Students will design and create a house that is functional for the average human that is contained inside a tin can. Aleksandr Mergold and Jason Austin architects from Pennsylvania have come up with the innovative idea of making pre-fabricated housing using farm grain dryers. Show your class their website (click on the news link and go to 2011 to see pictures) to get them inspired. Recyclable items like toilet paper tubes, plastic bottles & containers, etc. Break your class into groups. 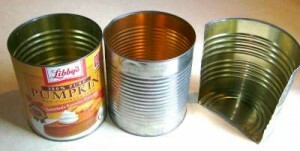 Challenge your students to create a house out of soup can or #10 can that is the most innovative and functional. You can also have the group that comes up with the most “green” house design win a special prize or more points. There should be “diorama” made out of a can and a write up and/or pictures describing the house. Remember that the design does not have to be just one can. Maybe two or three of different sizes attached some how. Give students time to work on their projects in class. Obviously, you may be thinking that cutting metal is dangerous. Good point. So either you can have your tech-ed department cut the metal cans in half for you like I did- as shown in the picture or you can use plastic soda bottles cut to size. To make a less sharp edge you can simply take a hot glue gun and put a thick layer of glue on the cut edge and let it dry. Either way, unlike the real architect’s picture of their can houses, I would not allow my students to cut the metal windows out. They can only glue paper and cardboard to the sides of their can to show where windows are. This project requires lots of cans so have students and your colleges save their cans and bring them in. Talk to your school cafeteria or culinary program to have them save their #10 cans (the large ones as pictured above). Have a guest speaker from your city come and speak to the students about building codes at some point before or during this project. It is important for students to understand that even though they may have great ideas for designing housing that there are laws in place that will prevent them from doing certain things. What things are important to consider when designing a house? How does cost play into this tin can idea? Would you be willing to live in a house like this? Why or why not? What are some problems that may arise if these architects were to build these houses? 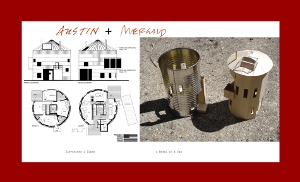 Have students do a formal presentation of their tin can homes.